I first became interested in the old wood-working crafts as a conservation volunteer in the early eighties, when scrub-clearing, hedge-laying and coppicing were part of my regular habitat management tasks. It was a short step from producing a supply of raw materials to wondering what people would have done with them in times gone-by. Unfortunately, the old craft industries were probably at their lowest ebb around then and it was very hard finding anyone to teach me any of the old skills. But a mixture of trial-and-error, reading such books as were then available and talking to the few old-timers who could still be found demonstrating at agricultural shows deepened my interest and advanced my knowledge. A number of years paid work in nature conservation in and around Oxford followed before I moved into full-time forestry. In both occupations I was able to work on my craft skills and, eventually, started doing demonstrations myself and then selling as a side-line and, eventually, running courses. After some twelve years in forestry I decided to make the sideways leap into hurdle-making and became a full-time coppice worker in association with the Pang Valley Countryside Project in Berkshire. In 2000 I moved down to rural north Devon and remained there until early 2008. Initially, my career as a coppice worker revolved almost entirely around hurdles and charcoal, but after a couple of seasons I dropped the charcoal burning and concentrated on the ‘cleaner’ crafts, expanding my repertoire to include gate-hurdles, post-and-rail fencing, wooden rakes, beesom brooms, tent pegs, shingles and laths: in fact, virtually anything that can be made from cleft and unseasoned wood. 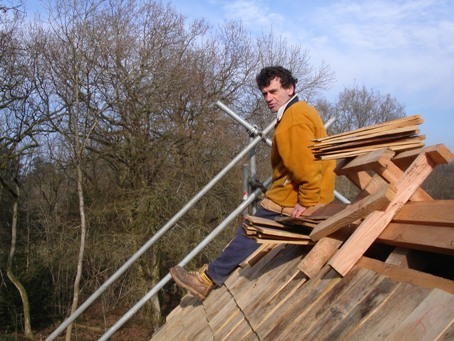 When I moved down to North Devon, I started to look more at the local coppice materials (good quality hazel being hard to find down there) and began working with oak coppice and the building of small round-timber framed garden structures. Ruth Goodfellow joined me as an apprentice in 2006, and shortly afterwards we moved up to Stroud in Gloucestershire. Living in Stroud, and with a Yard just outside Tetbury, has meant that I have been able to spend more time on the coppice restoration program in the National Arboretum at Westonbirt, that I started in 2002. This is providing us with a small (but growing) supply of hazel, some good quality ash and access to oak from the thinning program. It is also offering the opportunity to ‘sell’ the benefits of coppicing to a wide audience (Westonbirt is a very well visited site) as well as selling the coppice products themselves. The timber-framing interest has shifted sideways to sawn oak in response to the lack of coppiced oak and the availability of larger butts from the Arboretum. I am also selling firewood for the first time in an attempt to use everything that comes out of the coppice restoration programme. 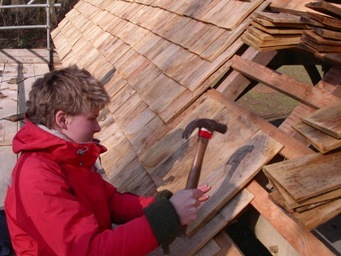 Oak butts into timber-framing; branchwood and thinnings into firewood; low grade coppice into bean poles, pea sticks and faggots, and the better quality stuff into hurdles. A holistic enterprise! We also still cut hazel in Hampshire where there remain good supplies of well-managed coppice, bringing the rods back to Stroud to be made up into hurdles. These cutting expeditions will probably decline in years to come as the hazel at Westonbirt improves, but at the moment it gives us a third area to market our products into. For anyone wanting to come and have a look at what we make, we always welcome visits (by prior arrangement, to make sure that we are actually here), or we can be found demonstrating at a number of shows in the west-country during the summer months (have a look at the Courses and Shows page). Also firewood and charcoal and coppice management services.